We’d love your help. Let us know what’s wrong with this preview of Hot and Cold by Richard Hell. To ask other readers questions about Hot and Cold, please sign up. Richard Hell gives me life. Like Beck said about Serge Gainsbourg, Richard Hell can make "something sublime out of something mundane" and find "beauty in the bottom of a garbage can" (Serge Gainsbourg: A Fistfull of Gitanes 136). That may serve as the best definition of punk, or at least on par with Aaron Cometbus' definition (something about not watching television or driving a car). 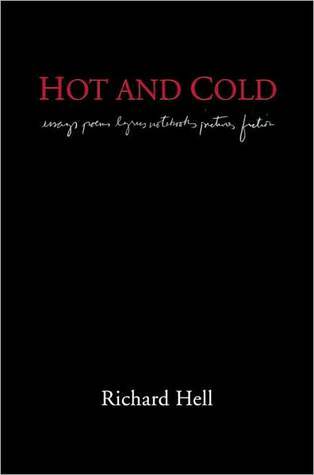 Hot and Cold is pleasurable in part because of its eclecticism, as the complete book title suggests. Particularl Richard Hell gives me life. Like Beck said about Serge Gainsbourg, Richard Hell can make "something sublime out of something mundane" and find "beauty in the bottom of a garbage can" (Serge Gainsbourg: A Fistfull of Gitanes 136). That may serve as the best definition of punk, or at least on par with Aaron Cometbus' definition (something about not watching television or driving a car). Ok, I am a mega-fan of Richard Hell. Besides being a rock icon he is also a great writer. "Hot and Cold" is an anthology of sorts of the loose ends in Hell's work. Images, poems, lyrics, little essays - it's a wonderful way to lose one self into the world of Hell. And if that's Hell I am for sure not interested in Heaven. The most viscerally I've ever responded to the written word. Light of my life, fire of my loins! I couldn't recommend this one more highly. Some really good essays in the back; but doesn't justify the price or some rather mediocre song lyrics and poems. Born in 1949, Richard Meyers was shipped off to a private school for troublesome kids in Delaware, which is where he met Tom (Verlaine) Miller. Together they ran away, trying to hitchhike to Florida, but only made it as far as Alabama before being picked up by the authorities. Meyers persuaded his mother to allow him to go to New York, where he worked in a secondhand bookshop (the Strand; later he Born in 1949, Richard Meyers was shipped off to a private school for troublesome kids in Delaware, which is where he met Tom (Verlaine) Miller. Together they ran away, trying to hitchhike to Florida, but only made it as far as Alabama before being picked up by the authorities. Meyers persuaded his mother to allow him to go to New York, where he worked in a secondhand bookshop (the Strand; later he was employed at Cinemabilia along with Patti Smith) and tried to become a writer. He arrived in the Big Apple at the tail end of the hippie scene. He took acid (and later heroin), but sought to develop a different sensibility in the manner of what he later referred to as 'twisted French aestheticism', i.e. more Arthur Rimbaud than Rolling Stones. He printed a poetry magazine (Genesis: Grasp) and when Miller dropped out of college and joined him in New York, they developed a joint alter ego whom they named Teresa Stern. Under this name they published a book of poems entitled Wanna Go Out?. This slim volume went almost unnoticed. It was at this point that Meyers and Miller decided to form a band. They changed their names to Hell and Verlaine, and called the band The Neon Boys. During this hiatus, Hell wrote The Voidoid (1973), a rambling confessional. He wrote it in a 16 dollar-a-week room, fuelled by cheap wine and cough syrup that contained codeine. He then played in various successful bands: Television, Richard Hell and The Voidoids.